$4.00 each mask/Buy 4 Get 1 Free! 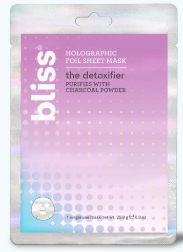 Recently bliss came out with some awesome sheet masks. Sheet masks have become all the rage lately and these are especially fun, they are holographic! That really jazzes up the sheet mask routine, doesn't it? There are 3 masks in the Holographic Foil Sheet mask series: hangover fix, the detoxifier and eye got this. The Hangover Fix is made for skin that needs a pick me up, whether you had too much to drink the night before or your skin looks a little tired and dehydrated. This foil-backed holographic sheet mask replenishes and re-balances dull, dehydrated skin for an instantly brighter, revived complexion. Essential probiotics and electrolytes help enhance skin's natural defense barrier and protect against free radicals. The mask hugs facial contours and forms a protective barrier to intensify serum delivery and absorption. This means that it delivers nearly a full bottle of serum in just 1 treatment!!!! And of course this mask is cruelty-free. It contains the following ingredients to make this mask work so well. Pear Extract is rich in vitamins and essential minerals. It is known to help balance skin and help retain skin's natural moisture for a smooth and soft complexion. Bifida Ferment Lysate and Lactobacillus Ferment Lysate are natural probiotics that are known to nourish, help strengthen skin's barrier and lock in moisture to leave the complexion hydrated and soothed. Sodium Citrate, Potassium Chloride, Magnesium Chloride and Sodium Chloride are electrolytes that help replenish and balance skin while protecting it from free radicals. After wearing this mask skin looks brighter, more radiant and skin definitely feels softer and more plump, and supple. Use this mask when skin is dehydrated or very dry. I would recommend this for all skin types as it does not cause acne lesions. As long as skin is not full of active pustules I think it would be fine to use on any skin type. To use: apply foil sheet mask onto a clean, dry face. Adjust eye, nose and mouth openings to fit. Leave on for 15-20 minutes. Remove the mask. Gently pat remaining serum into skin (No need to rinse). Willow Bark Extract is a natural and gentle exfoliant that helps slough off dead skin cells, making way for fresh, bright and radiant skin. Charcoal Powder is known to bind and help pull out dirt, sebum and debris from pores, making them less visible. Kaolin, which is also used for making porcelain, is a mild clay that helps absorb impurities without removing natural oils in the skin. After using this mask, skin feels clean, detoxified and radiant. It definitely feels smoother and somewhat brighter too. The charcoal pulls out so much gunk from the pores that you may experience a some small pimples popping up afterwards. That are any impurities that are leftover. To use: apply foil sheet mask onto a clean, dry face. Adjust eye, nose and mouth openings to fit. Leave on for 15-20 minutes. Remove the mask. Gently pat remaining serum into skin (No need to rinse). Acetyl Hexapeptide-8 is a powerful peptide that is known to visibly smooth fine lines. Sodium Hyaluronate is a unique lightweight moisturizer with an even smaller molecule size versus hyaluronic acid that holds 1000 times its own weight in water. Hydrating Blend with Xylitol is a unique vegetable-derived combination of moisturizers that help limit water loss. After using this mask, your eyes will be brighter, less puffy and dark circles will be decreased. Try to use whenever your eyes get like that to keep them from being tired looking. To use: apply foil eye masks onto clean, dry under-eye area. Leave on for 15-20 minutes. Remove eye masks. Gently pat remaining serum into skin. (No need to rinse). I love these masks! Even though they are a little different than regular sheet mask, I like how they hug the contours of the face a git better than regular sheet masks do. These are fun masks to use and they work great. For $4.00 per mask that is not too bad if used once per week. Bliss does have a deal where you can Buy 4 Get 1 Free right now. 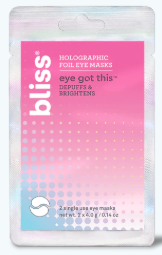 bliss Holographic Sheet Masks are available online at www.blisssworld.com, www.target.com and at Target stores. Like Bliss World on Facebook.com: https://www.facebook.com/BlissSpa; Follow Bliss World on Twitter:@blissspa;Follow Bliss World on Pinterest: https://www.pinterest.com/blissspa/ and Follow Bliss World on Instagram: https://www.instagram.com/bliss_spa/.